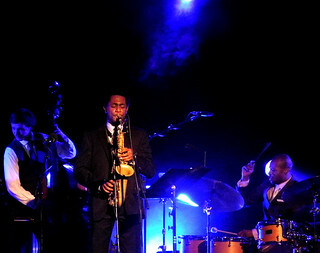 Three days at the London Jazz Festival. Three gigs a day plus talks and other stuff. An intense weekend of jazz… When I lived in London, I was much more measured in my approach to LJF, but cramming it in like I did this year makes it a different experience – and it means I heard some wonderful music I would otherwise has missed. My first performance was a project in improvisation with three schools and a trio of Corey Mwamba, Dave Kane, and Joshua Blackmore. Each musician worked with pupils from one school to create improvised music, and then played a trio set before leading everyone in a short improvised piece. I was there because I like Mwamba’s playing; but I was energised by the music the school pupils made. Intrinsically simple, but it really worked. 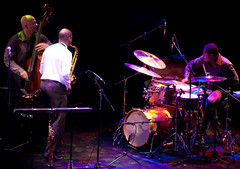 Back at the Queen Elizabeth Hall – jazz festival central – I saw a packed out set by Peter Edwards trio. It was a lively, assured performance. I love Edwards’ playing. 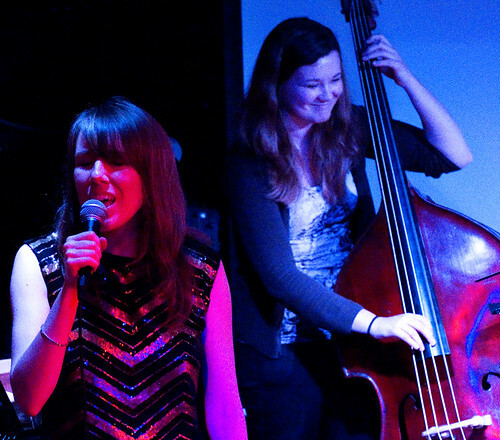 Mostly originals, with a couple of standards like Monk’s I Mean You, the trio highlighted tracks from their new CD. The second half was almost entirely given over to Tim Whitehead’s Turner project, consisting of tunes that Whitehead had improvised at the sites of Turner’s paintings on the Thames in west London, which Whitehead had then expanded into full scale compositions. He started off with a quartet, but it proved to be an expanding band, players joining (and leaving – some had other gigs to go to!) 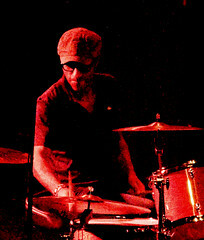 throughout the set – I think it finished up as a twelve piece, bit I wasn’t counting. This was great music, lively, fun and exciting. 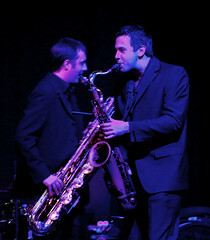 Jonathon Gee was on piano, and Whitehead was joined by several horn players – the great Chris Biscoe on baritone, Henry Lowther excellent on trumpet, and Matt Waites, Pete Hurt and Jimmy Hastings on a variety of saxes. This was a wonderful evening of uplifting music, which finished off with just about everyone on stage jamming to a standard as an encore. The next day’s jazz started with an afternoon set by the Dedication Orchestra. 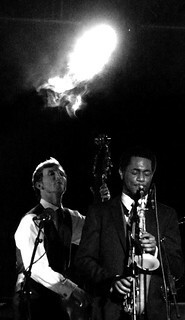 Playing the music of Chris McGregor’s Brotherhood of Breath and the Blue Notes, this was the gig that had actually got me down to London to are them: they don’t play often, and frankly they are not to be missed. A star studded line up with sins of the best of British jazz (including a couple from the previous night’s gig) and headed by an ever ebullient Louis Moholo-Moholo, the only surviving member of the Blue Notes, they played a joyous set of arrangements familiar to fans of the Brotherhood of Breath, together with some new arrangements commissioned from Alexander Hawkins. Personally, the band could do little wrong: I was bound to enjoy this no matter what, and I did. My only quibble would be that the music seemed so heavily arranged, lacking the spark of anarchy that seems to linger so close to the surface when listening to recordings of the Brotherhood of Breath, a spontaneity McGregor apparently worked hard to maintain. But that’s a minor gripe: I loved this set. It just made me smile. 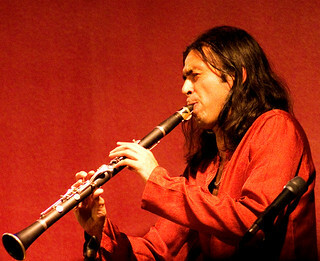 This was followed by a discussion of music and influences by clarinetist Arun Ghosh and pianist Zoe Rahman. Over two afternoons, they sat and played some of their favorite tracks, and demonstrated how their own playing had been influenced. Despite a packed house, this felt really intimate: two people talking about music and what it meant to them. When they played, there was a real energy and excitement to their music. Really, really fun. More, please. I then headed off to Kings Place to see John Surman and the Bergen Big Band, which I reviewed for the LondonJazzNews blog. My plans for Sunday afternoon were changed at the last minute, and finding myself with a free afternoon I decided to check out Leo Appleyard, because I had his new CD. Only to find out his gig was sold out. Great for him, disappointing for me! Instead, I headed to the Spice of Life where I spent the afternoon drinking beer and listening to the very enjoyable London City Big Band. Back to the South Bank for the second installment of Arun Ghosh and Zoe Rahman’s conversation about music, and then my LJF experience for 2014 finished off with a great gig, the Tori Freestone Trio – who were very good – followed by the Henri Texier Hope Quartet – who were astounding. I wrote about that for LondonJazzNews, too. 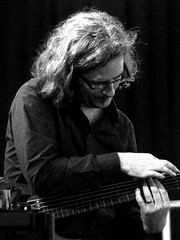 This entry was posted in Jazz and tagged Alexander Hawkins, Arun Ghosh, Brotherhood of Breath, Cafe POSK, Chris Biscoe, Chris McGregor, Corey Mwamba, Dedication Orchestra, Emily Saunders, Flo Moore, Henri Texier, Henry Lowther, Jimmy Hastings, John Surman, Kate Williams, Kings Place, Louis Moholo-Moholo, Matt Waites, Nettie Robinson, Pete Hurt, Peter Edwards, Queen Elizabeth Hall, Rich Mix, Spice of Life, Tim Whitehead, Tori Freestone, Zoe Rahman on February 4, 2015 by patrickhadfield. 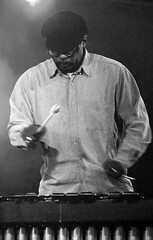 Empirical at London Jazz Festival, November 2011. 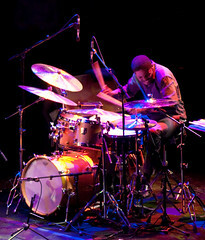 This entry was posted in Jazz and tagged Lewis Wright, LJF, Nathaniel Facey, Queen Elizabeth Hall, Shane Forbes, Tom Farmer on February 11, 2012 by patrickhadfield. Free Jazz at LJF. November 2010. The last day I took advantage of more free music – in both senses of the term. There was a triple bill down at the Festival Hall – or, at least, I saw three bands… The first was a trio of Steve Lawson on bass, Otto Fischer on guitar and Tony Buck on drums. This trio didn’t grab me much – it seemed a bit like they were each playing their own thing without adding to each other; perhaps I couldn’t just make sense of it. 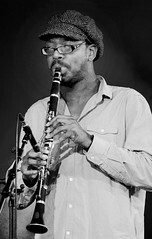 They were followed by Shabaka Hutchins on clarinet, Tony Bevan on sax, Phillip Barre on bass and Tom Skinner on drums. This grabbed me much more – Bevan and Hutchins played some fiery solos, Barre and Skinner pushed things along. This was much more exciting. Best of all, though, was Orphy Robinson’s Cosmic Raw Xtra Four. I saw Orphy’s Cosmic Raw Xtra big band last year, and that was a brilliant gig. This quartet was quite different: with Lawson on bass and Fischer on guitar, and the great Steve Noble on drums, Robinson created some amazing music. 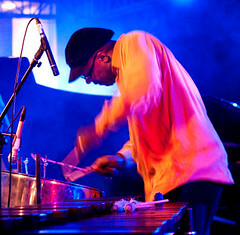 It was a step above the rest – brilliant vibes and steel pan from Robinson, and energetic drums from Noble. They were all together: they played as a unit, not four individuals. It was a really exciting end to the festival. 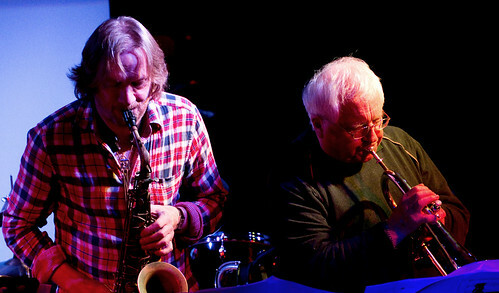 This entry was posted in Jazz and tagged LJF, Orphy Robinson, Phillip Barre, Queen Elizabeth Hall, Shabaka Hutchins, Steve Lawson, Steve Noble, Tom Skinner, Tony Bevan, Tony Buck on November 28, 2010 by patrickhadfield. 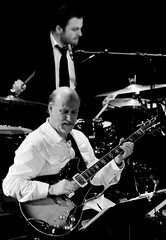 John Scofield in trio and with SNJO. London, November 2010. Monday night at LJF was one where my high expectations weren’t fully met. 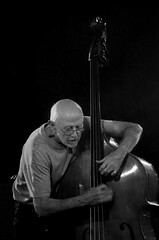 It started with John Scofield in a trio with bassist Steve Swallow and drummer Bill Stewart, his regular rhythm section. (Last time I saw Swallow play, it was with Andy Sheppard…) They played a mixed set of standards and Scofield’s tunes – a couple of their standard ballads were exquisite – and all three were excellent. The disappointment came with the second set, which matched Scofield with the Scottish National Jazz Orchestra – and only because I was really looking forward to it! Playing arrangements of Sco’s tunes and some from his time with Miles Davis, it felt at times as if Sco and the SNJO were pulling in different directions – as if Sco’s loud guitar was fighting with the orchestra. Knowing both Sco and SNJO’s music, this seemed like such a waste: Sco’s record Quiet has some beautiful, haunting brass arrangements, and those commissioned by SNJO didn’t really match up. 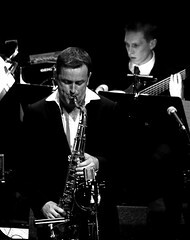 There were some great moments – Ryan Quigley on trumpet, Martin Kershaw on alto and Alyn Cosker on drums all played good solos, and Tommy Smith, SNJO’s director, was on his usual fine form, but this was just a good rather than great gig. 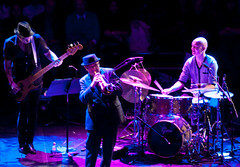 This entry was posted in Jazz and tagged Alyn Cosker, John Scofield, LJF, Martin Kershaw, Queen Elizabeth Hall, Ryan Quigley, SNJO, Steve Swallow, Tommy Smith on November 28, 2010 by patrickhadfield. 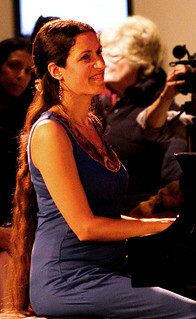 Manu Katche at London Jazz Festival, November 2010. The London Jazz Festival finished last weekend, and seven days on, it seems like a good time to take stock. I went to nine paid-for gigs, two free gigs which I had planned to see, I caught a couple of free gigs which I hadn’t planned, and a couple of other free events. I had a busy ten days – possibly too busy: it felt like trying to cram six months’ live jazz into ten days – and many clashes: the curse of the festival. I had to chose what music to miss as well as what to see. All in all, then, it was an eclectic mix of musicians and styles over the ten days. 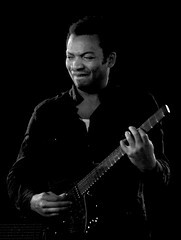 I started off with Manu Katché. 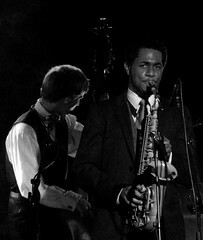 Part of the festival’s French programme (there was a fair bit of jazz nationalism this year: there were French, Danish and Scottish streams – it somehow seems a bit against the grain to me, since I see jazz as an inclusive art form, encompassing peoples regardless of race or origin), he played with a quartet with saxophone as the lead instrument. 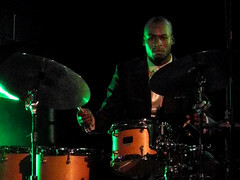 Though Katché is a drummer, this wasn’t a drum-heavy sound, but it somewhat lacked the full balance of his recorded work. 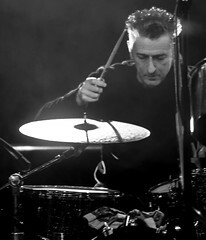 His drums sounded great from the back of the Royal Festival Hall – a rarity, since they are often mixed to mud in large halls. I enjoyed this set, but I didn’t think it was great music. 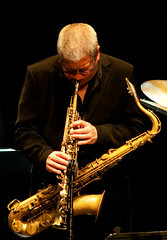 This entry was posted in Jazz and tagged LJF, Manu Katche, Queen Elizabeth Hall on November 28, 2010 by patrickhadfield. Ian Carr Tribute. London, February 2010. Tuesday saw the tribute to Ian Carr, who died last year. 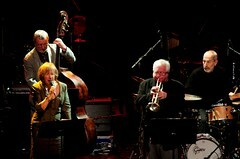 It gathered together musicians who had worked with Carr in various bands from the 1950s on, playing his music. It was an eclectic evening, reflecting the depth of Carr’s interests and influence – he was an educator and writer as well as a player (he wrote one of the definitive biographies of Miles Davis, and I attended a big band workshop he ran once in Edinburgh about ten years ago). Julian Joseph was the compere for the first half, and he spoke warmly of Carr’s influence on him through regular weekend music schools. Then Nikki Yeoh took to the satge and played a couple of pieces she dedicated to Carr. These pieces seemed a little knowing – deliberately complex in their form, lots of changes in tempo – but they held the audience’s attention. 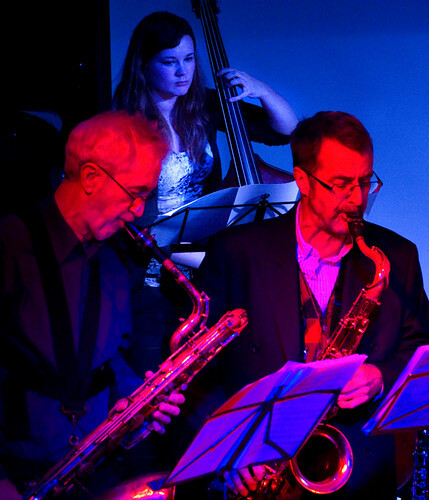 Then came the Michael Garrick sextet, featuring musicians who had played with Carr in the 1950s and 1960s. Garrick was the pianist in the seminal Don Rendell/Ian Carr quintet, and Rendell himself came up for a few numbers at the end of the set. 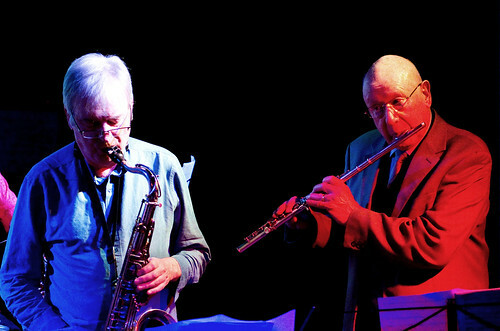 Rendell looked quite old (he must be in his seventies) as he walked on stage, but with his saxophone playing he could have been one of the young turks – the music sounded fresh and contemporary. There was a clean simplicity to many of the numbers; at one point, Garrick accompanied a poet with a simple two chord backing, before the band came in to fill the sound out. Norma Winstone sang to several tunes; normally I don’t get jazz vocals, but here her words fitted perfectly. Dave Green on bass held it together really well: there was a solidity to his playing. 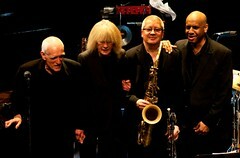 This was a great set, summing up the post-bop milieu of the band’s 1960s heyday. Henry Lowther took the trumpet chair, doing justice to Carr’s memory. After the interval, Kevin Whately – perhaps better known as Inspector Lewis – spoke about Carr’s connection to north east England, before Guy Barker on trumpet and Tim Whitehead on reeds were joine by a string orchestra to play Carr’s Northumbrian Sketches. This suite was superlative. Normally, I don’t like strings in jazz: too many syrupy, sentimental arrangements. This suite is one of the exceptions. There was nothing sentimental here: the arrangements merged the two disciplines of jazz and strings exceptionally. Barker’s playing was excellent, as was Whitehead. The suite seemed magnificent: the writing had depth and subtlety, creating a spiritual mood of remembrance. There is a real folk feel to some sections, the strings at times producing sounds reminiscent of the northumbrian pipes. It was a wonderful performance. After the sketches, Nucleus seemed a little – well, ordinary. This was not what I had been expecting: I have several Nucleus disks, and ordinary isn’t the way I’d describe them. Carr was one of the innovators who created jazz-rock, but unlike any of the other music in the evening, this sounded rather dated. 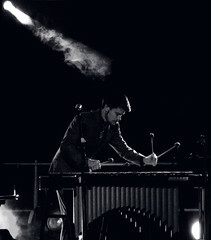 The performance was good – the playing seemed fine – but a bit of a let down after what had preceded. Until, that is, John Marshall came on for the last half of the set. His playing seemed to energise the others in the band, and suddenly they were playing better: they all stepped up several gears. 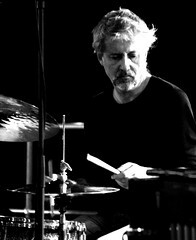 Nic France, who moved from drums to percussion when Marshall arrived, had been doing a great job – but Marshall just propelled the band into a different league. They seemed like a different band. The last few numbers powered along, pushed by Marshall’s excellent drumming. The evening ended on a yet another high. 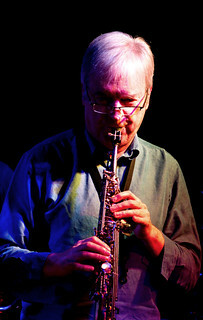 This entry was posted in Jazz and tagged Chris Batchelor, Dave Green, Don Rendell, Guy Barker, Henry Lowther, Ian Carr, John Marshall, Julian Joseph, Michael Garrick, Nikki Yeoh, Norma Winstone, Nucleus, Queen Elizabeth Hall, Rob Statham, Tim Whitehead, Trevor Tomkins on February 25, 2010 by patrickhadfield. 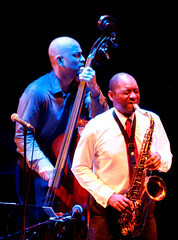 Branford Marsalis. 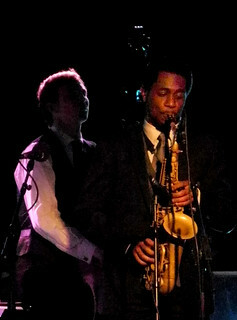 London Jazz Festival, November 2009. 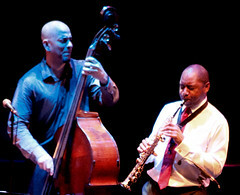 Monday night at the London Jazz Festival saw saxophonist Branford Marsalis hit town, briefly. 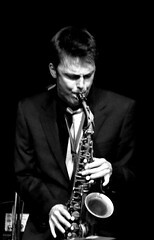 He was preceded by award-winning pianist Robert Mitchell and his trio. They played a short but impressive set – I could have done with more, and I really want to see this band again. But it was Branford’s evening. With Faulkner’s drumming, Calderazzo’s supportive piano and Eric Reavis’ bass, it was hard not to think of Coltrane’s quartet – especially when Marsalis was on soprano. He played lots of long solos, and even though he was laying down streams of notes, his sound remained warm and creative – he didn’t sound too “technical”, a trap some saxplayers fall into. He wasn’t showing off, he was just playing the best he could. For the encore, Marsalis brought on British pianist (and Radio3 jazz presenter) Julian Joseph for a great version of St Louis Blues. This is such a standard that it must be hard to pull off – everyone in the audience probably has their own, favourite version. (Mine is Gil Evans’ from album “New Bottle, Old Wine.”) I had to stop myself singing along. The band brought their own style to this old number whilst simultaneously playing it straight. Branford’s younger brother Wynton would have felt proud – this was new, exciting music but deeply in the tradition. 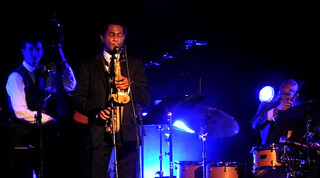 This entry was posted in Jazz and tagged Branford Marsalis, Joey Calderaazo, Julian Joseph, LJF, Queen Elizabeth Hall, Robert Mitchell on November 18, 2009 by patrickhadfield. Trumpets. And hats. 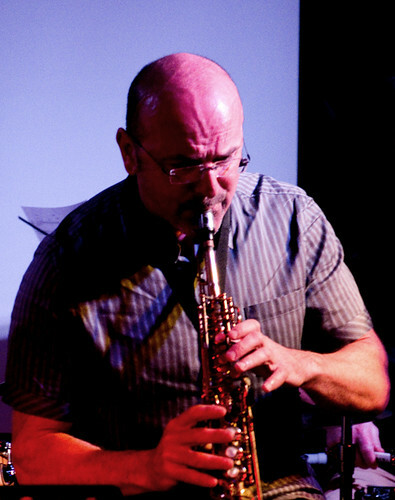 And three saxophones… Brass Jazz and Tomasz Stanko. 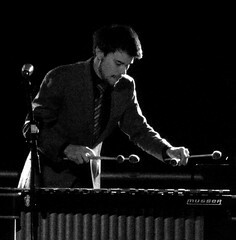 London Jazz Festival, November 2009. 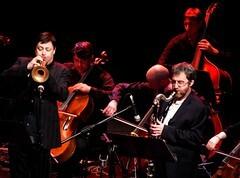 First gig of the London Jazz Festival for me was Brass Jaw at the Barbican. 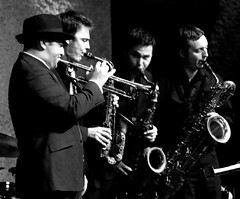 A somewhat misshapen saxophone quartet – Paul Towndrow on alto, Konrad Wiszniewski on tenor and Allon Beauvoisin on baritone – they also feature Ryan Quigley on trumpet. I had seen all these musicians before, but I had somehow missed them in this line up before. Quigley was the man in the hat. The Barbican was busy, lots of people waiting to hear the band play, so there was bemusement when saxophones were heard in the distance: we thought we were in the wrong spot. But the sound got louder, and I realised the band were coming to us. They came up the stairs and moved through the audience. People were surprised – it isn’t often you come face to face with a trumpet bell, and a moving baritone sax isn’t to be messed with! Climbing on stage, they proceeded to play a great set, especially that they had battled through stormy seas and a lack of sleep to get there. 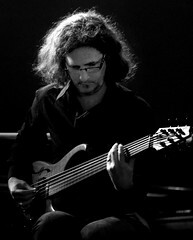 They mixed standards with originals – Beauvoisin featured on a fine version of Ain’t Necessarily So; he did a great job of keeping the quartet together throughout the gig, taking the bass line and holding them steady. 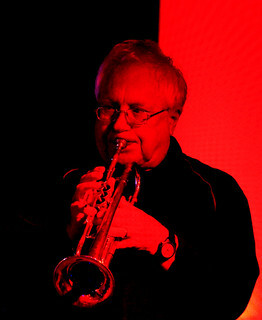 Perhaps because he had a different sound, trumpeter Quigley stood out. He hits the high notes and plays the showman, too. 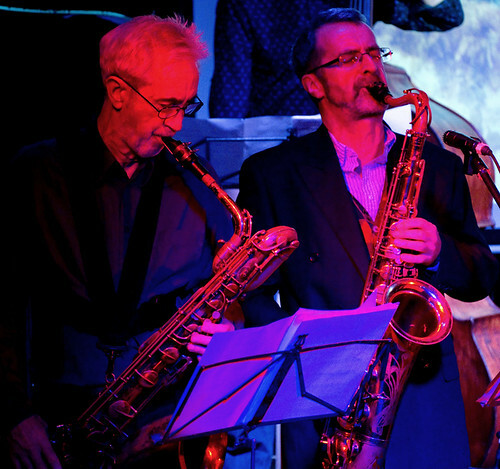 All three saxophones played well – they all have different styles, so it meshed well. 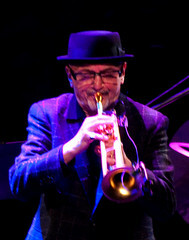 More trumpet – and another hat – in the evening when Tomasz Stanko took to the stage at the Queen Elisabeth Hall. 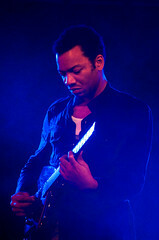 With a young quintet featuring electric guitar, he had a wistful, ethereal sound – distinctly European, I’d say. The guitar invites comparisions to mid-1960s Miles – Stanko has a similar tone to Miles, too, and he plays similar runs. Also like Miles, he doesn’t say a word – the music has to stand on its own. His tunes are impressionistic and abstract. 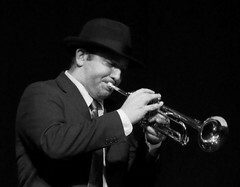 His trumpet sound is very clear – European cool perhaps (in contrast to Quigley’s fiery high notes). 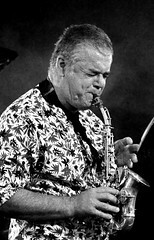 Stanko is the dominant voice in the quintet. The piano loses out a bit to the guitar, which is the second solo instrument, the piano being relegated to rhythm. The coolness in the music means they don’t necessarily connect with the audience, and at times it appeared like they were on autopilot. They still created a lovely, fresh sound. 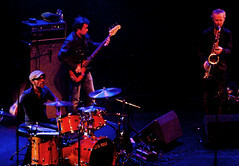 This entry was posted in Jazz and tagged Allon Beauvoisin, Brass Jaw, Konrad Wiszniewski, LJF, Paul Towndrow, Queen Elizabeth Hall, Ryan Quigley, The Barbican, Tomasz Stanko on November 18, 2009 by patrickhadfield.